The blue flowers are "forget-me-nots"
Josef’s long, heartfelt letter of May 25th, 1911, (click: If you love me...) could not yet have reached Lisi in Transylvania when she picked out this sweet postcard and wrote to him on May 30th. 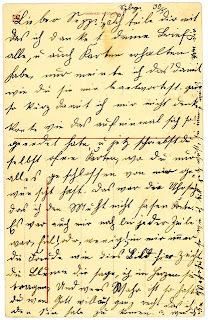 For one thing, she chastises him for sending her such a “short” response, making clear she hasn’t yet seen the May 25th letter in which he exhorts her, in determined pleadings, to come to America (“If you love me, you will come here”). Below is an approximate translation. Thank you for all your letters and also postcards, which I’ve received. But your answer to my long letter is very short. Also, you asked me to keep all the writing from you to me hidden from the eyes of others, but then you send me a post card where everyone can read what you say! That’s the main reason I feel annoyed and am uncertain if I should make the trip to America. But just like the flowers [bloom] on this card [forget-me-nots], joy blooms in my heart because I know that I love you and that you love me. God knows what is right. I have in mind that I should come. You are a twenty-three year old young woman--one hundred years ago. You were raised in a small town of all German-speaking people, and now work in the larger town eighteen miles away. You secured an enviable job with one of the most prominent families in the area, a family of merchants, politicians, church luminaries, doctors. You’ve served them well, especially the mistress of the house, been responsible for the vast staff she has to feed and manage, taken care of her little daughter and loved her as your own. The translation is difficult, but it seems Lisi is leaning toward joining Josef in America. But by the time she writes again, she will have received Josef's desperate pitch ("If you don't come here, I know you don't love me." see If you love me...). 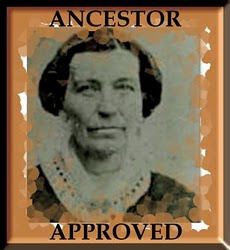 Her response on June 7, 1911 -- up next. I look forward to your hearing from you. Please click on the word "comments," centered, below this post and leave me a message. Sam Ebner, Lisi's brother, died in the Battle of Galicia, one of the earliest battles in WWI. (See previous two posts: The Fallen-Part I and The Fallen-Part II). 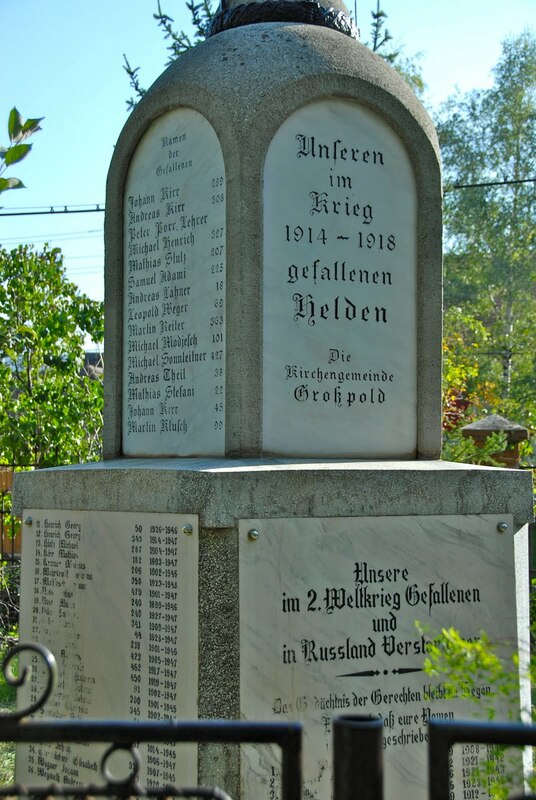 I wrote about my brothers and my 2007 visit to my grandmother’s (Lisi's) church courtyard in her hometown of Grosspold, where we discovered this monument inscribed with “Our Fallen Heroes.” Lisi's brother’s name, Samuel Ebner, was carved near the top. 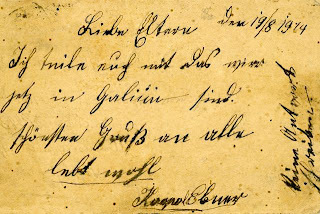 But it wasn’t until I was able to decipher several letters from Lisi’s father (also Samuel) back home in Grosspold, that I realized Lisi’s direct connection to and partial responsibility for this memorial honoring her brother and other fallen soldiers of "The Great War," as it was known. 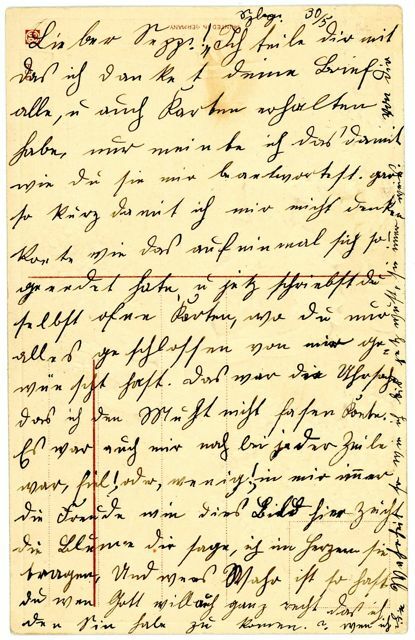 Here are two letters Samuel Ebner, the father, wrote to Lisi and Josef. The first is undated, but the content and date on the second make it pretty clear that both are from 1936. I must ask you for 100 Lei by March. At that time, a memorial for the fallen soldiers [of World War I] will be erected in the church courtyard and on this monument, the names of the dead will be written in gold letters. So I want to make this little request for 100 Lei* to be given for Sam. I’m late writing because of...the memorial to our heroes who were laid to rest in foreign ground. The Memorial stands in the Church courtyard. I paid with the money from you, and your name was inscribed. But my grandparents had sent more than just the 100 Lei* for the monument -- ten times more, in fact. The remainder of the letter shows just how much Lisi was helping her extended family during desperate times in 1936 Romania. I received the 1000 Lei, and I send you my deepest thanks for it. I have often said already that we are so lucky to have you. Other people say how nice it is when the children think about their parents. Best thanks again, you Dear Ones, for the money. We have paid the taxes for 1936 and bought pigs for next year. Although separated by thousands of miles and away from her home town for twenty-five years, Lisi maintained strong ties to her homeland. One hundred years after she and Josef emigrated from Siebenbürgen/Transylvania, we can still see today the visible impact they made on a land their hearts had never left behind. 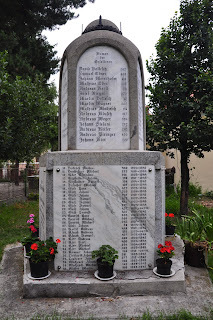 In the first post in this three-part series about Samuel Ebner, my grandmother's younger brother, I explained how my two brothers and I discovered this monument to the fallen soldiers in World Wars I and II in the courtyard of my grandmother, Lisi's, home church in Grosspold, Romania. Samuel's name was listed near the top of the World War I "fallen." (See The Fallen-Part I). 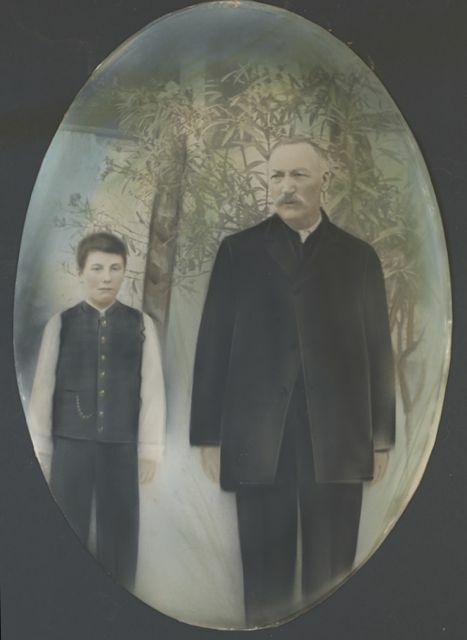 We didn't know much about young Samuel (also my great-grandfather's name), but this photograph, at left, always hung in a prominent place in my grandparents' home and now hangs as part of a 100-photo family history wall extending up the wall along my front stairway. It's the two Samuels: father and son. Hand-colored with pastels, the photo was made about 1902-05. I share with you that we are now in Galicia. Most beautiful greeting to all. Farewell. On the right side he’d added: Don’t answer [this letter]. Perhaps he didn't know where he'd be. Perhaps he knew what a terrible battle he was about to enter. 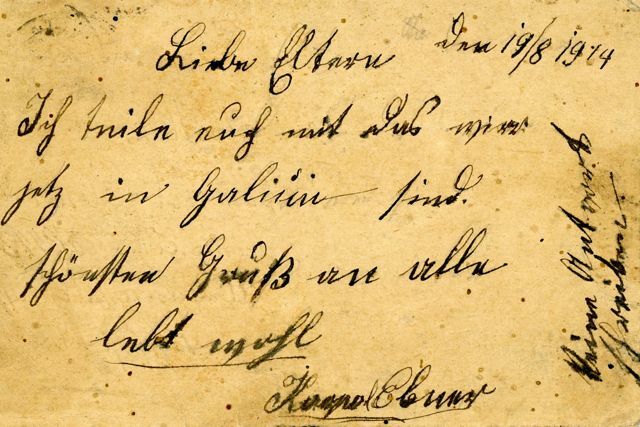 The day before young Samuel wrote this card, on August 18, 1914, the Russians had invaded Galicia from the east, in one of the earliest battles of World War I. The Russian army would eventually devastate the Austro-Hungarian Army in which Samuel was soldier. He died during the Battle of Galicia on August 26, 1914, just eight days after penning his last words. 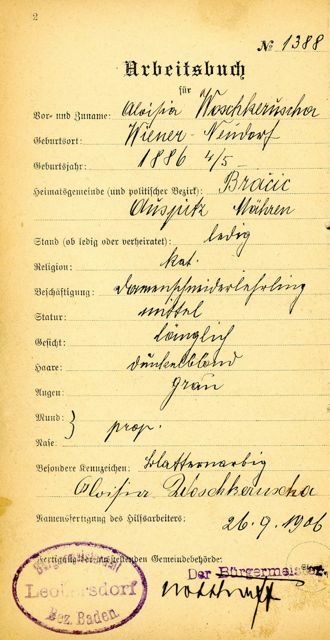 His birth and death dates (latter barely legible) were entered into the Family Book from the Evangelische Lutheran church and show he was born June 16, 1893. He was twenty-one when he died. I’m sending you here the most valuable thing I’ve ever had--because it is the last writing from our dear brother, Sam--in the hope that you will treasure it as I have. 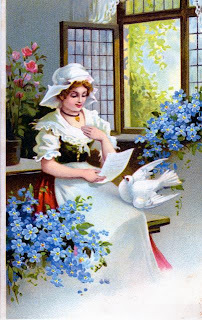 The fact that I still have this postcard, almost 100 years later, is testimony to the care my grandmother took with this precious last message. But not only did she save her brother’s memory in this modest missive, she helped make possible the impressive memorial whereon were inscribed her brother’s and his fellow fallen comrades' names. More on how I discovered this connection in the third part of this series on Samuel Ebner, "the younger." Look for "The Fallen - Part III" next Travel Tuesday. "Names of the Fallen" #403 "Samuel Ebner"
Many of us family history buffs have relatives/ancestors who fought in World War I and/or II, and if they died in those wars, it’s likely we might find their names on a memorial in their home town, on a plaque in a church, or eulogized in a newspaper article. When we visited Grosspold in Transylvania (prior to 1914, part of the Austro-Hungarian Empire) to find my great-grandfather’s house, we weren’t looking for a memorial, but we unexpectedly found one. On the other three sides are listed “Names of the Fallen,” including my grandmother’s brother, Samuel Ebner, born 1894. His name is the second from the top (left photo. Close-up at top of this post). But it wasn’t until several of the letters in my collection were deciphered from the old German script that I made some astounding connections, both about this monument as well as the last words the family ever heard from young Samuel. Watch for "His Final Words," coming up. 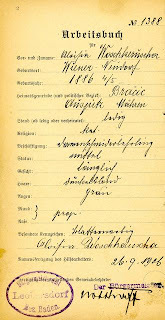 Today, May 4, 2011, marks the 125th birthday of my maternal grandmother, Alöisia nee Woschkeruscha (VAUSH-ker-UZSH-uh). Luisa was born in 1886, in the town of Wiener-Neudorf, not far from Vienna, Austria. She was baptized four days later on May 8th. Death was so common for infants, parents wanted to be sure they were baptized as soon as possible to assure them their place in heaven. 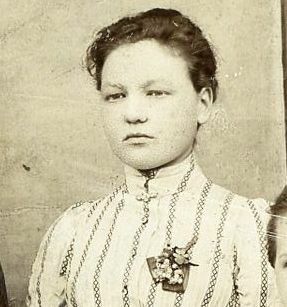 I first wrote about Luisa in a Carnival of Genealogy blog for Women’s History Month (see Dressmaker Extraordinaire). We can learn a lot about Luisa's appearance from the first page of this book, and the way a simple piece of identification can serve to undermine a young woman’s self- esteem. Dated: September 26, 1906 -- she was twenty years old. 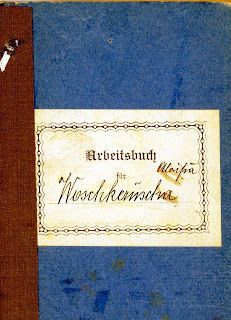 I can’t help but imagine how embarrassing it must have been to have to present her Arbeitsbuch to potential employers and have themn search her face for the pockmarks so unkindly included in her description. About seven years after this book was created, Luisa would leave for America. I have one letter she wrote, which reveals a young woman of remarkably good humor and confidence as she makes her way in a new country on her own. Coming up in future posts. But first I want finish the Travel Tuesday posts about Sam Ebner's death in World War I and the unexpected connections I discovered between my grandparents in America and the monument built in Romania to honor the fallen. 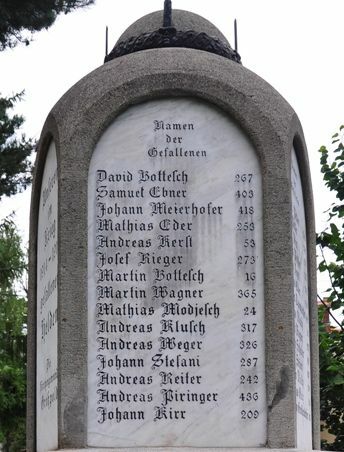 The letters were hidden for decades, but when they were brought to light, their indecipherable handwriting unraveled, and the readable German words translated into English, they revealed unknown secrets about my family's relation to this monument and a relative whose name appears right near the top. War Memorial--Grosspold, Romania--my grandmother, Lisi Ebner/Gartz's hometown when it was still part of Austro-Hungary. What this war memorial revealed to my siblings and me on our 2007 visit to Grosspold, my grandmother's hometown in Romania. The last words of one of Grosspold's "Fallen Heroes." Lisi and Josef's role in creating this memorial--from 5,000 miles distant.